Lori Lerner grew up in Monterey Park, California and graduated from UC Berkeley. She has been News Director at almost every radio station she's worked at and along with scores of regional and national awards - is the recipient of 6 prestigious Golden Mikes. Her fortuitous luck began at KRE/KBLX in Berkeley where she broke the Patty Hearst kidnapping story. 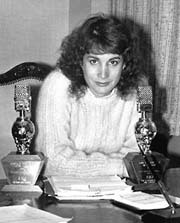 Lori's illustrious broadcast career in Los Angeles includes stints at KPOL '73; KKDJ '73-'76; KLVF '75, KIIS '76-'81, KHJ '81-'83 KRTH '83-'85, KMET '85-'86. Lori started RADIO LINKS in 1986 with the goal of delivering beautifully produced features with crisp sound bites and movie clips to radio stations, syndicators and networks. RADIO LINKS has become a standard programming tool in the industry. Thousands of radio stations count on these features for a regular part of their programming. Lori and husband Larry, who live in Malibu California, have three children. All audio sound-bites and clips, images, and text on this website, retain their original copyright as owned by their respective movie production companies. All of the above is for promotional purposes only and Radio Links Hollywood and www.radiolinkshollywood.com holds no liability from their misuse.